Am I the only one who takes note of something I do and then gets really really happy with the prospect of doing that same thing repeatedly, at the same time and the same day of every week? I get excited when I’ve come across a promising new routine. Gleeful even. Routines are predictable. You can count on them. They are always there, peeking out at you, probably saved in your phone alarm or reminder app to perpetually remind you of their existence, once you take that important next step and decide you want to follow through with them. That you have every intention to make this life-altering positive change in your life and that you will consciously choose this path every time you come across this option. This fork in the road. Routines are safe and comfortable because, by nature, they encourage a sense of structure or formula in one’s life. Yes, I will run on Tuesdays, Thursdays and Saturdays every week. Yes, I will go grocery shopping every Wednesday. Yes, I will wash my hair every other day. And then, almost as soon as I’ve conjured up this new auspicious regimen for the improvement of my life – one that I am so sure will be the single most important change I will make in this moment and for my foreseeable future – I drop it. I drop it and I move on to the next thing. Why? I think deep down I desire structure in my life, but then as soon as I give myself some, I want none of it. Maybe I’m an anomaly, or maybe this is just human tendency. Because routines are not how life works. Not really. Life is constantly changing and evolving and growing and learning and developing. And I personally wouldn’t have it any other way. When it comes to produce and meats and cheeses, I get what looks the best and freshest at the time. Then I bring it all home and either cook something familiar or experiment with something new. Sometimes I discover that a dish I’ve made with peas and carrots and bacon one night will work just as well with broccoli and ham another night. 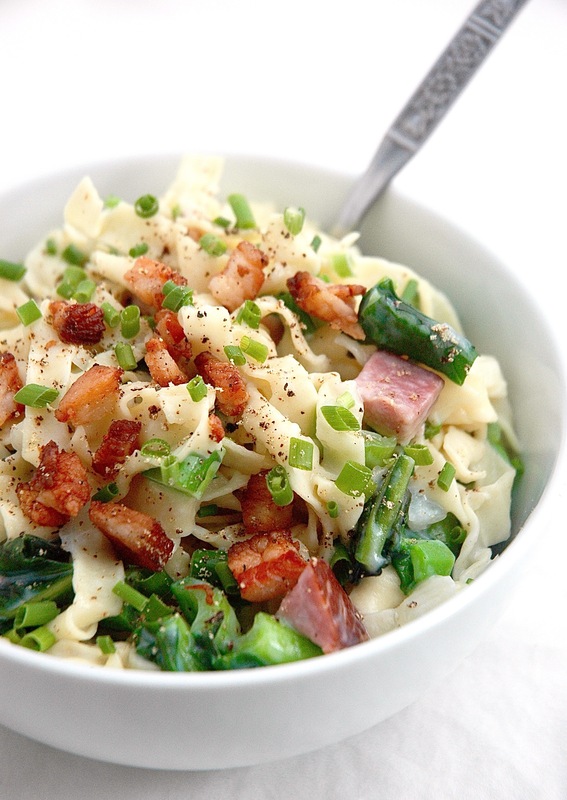 This fettuccine with bechamel sauce, mustard greens, and smoked ham is such a dish. Even the sauce can change subtly depending on what you have on hand. For example, today I brought home a thick-cut piece of smoked ham from Sea Breeze farm (our local butcher) and I rendered the fat from the top of the cut. Then I cooked my onions and garlic in it, instead of butter, and it provided a rich base for my bechamel sauce. But the top fat from thick-cut smoked ham is not a requirement for this recipe to be successful. Not at all. Butter will do just fine. Olive oil can work too. Use what you have on hand. You can also replace the onions with scallions or leeks. You can replace the ham with bacon, pancetta or even thin-sliced deli ham (I’ve tried all of these combos). Heck, you can substitute shiitake mushrooms instead of the ham for a similar effect. Throw your favorite greens into the mix and call it a day. It’ll be delicious, promise. The bechamel sauce is easy and, just because it has a fancy name, shouldn’t intimidate. It’s fat + onions + garlic + flour + milk + nutmeg + S&P + a whisk and a little patience and occasional stirring. It’s also extremely versatile and like I mentioned above, pairs well with any pastas or fresh vegetables you’ve got on hand. Heck I’ve even slathered it on top of baked potatoes for a successful creamy saucy healthy-yet-decadent meal. I hope you’ll try it. 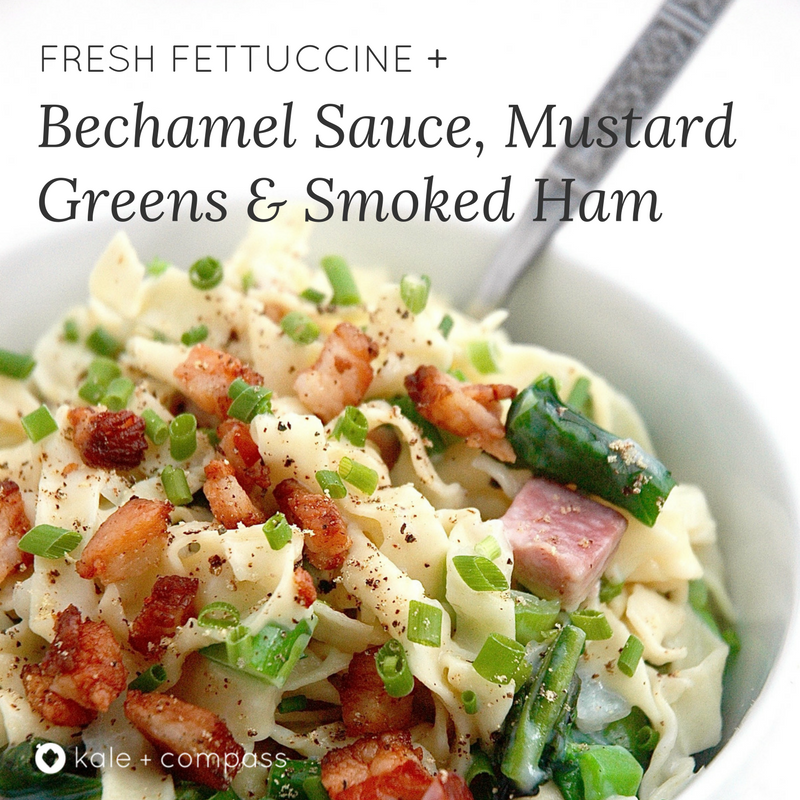 This recipe for fettuccine with bechamel sauce, mustard greens and smoked ham is so delicious (and easy!) you’ll want to add it to your regular routine. Promise. Set a large pot of water to boil over high heat. Once boiling, add a generous amount of salt. Melt butter in a large skillet over medium heat. Add onions and garlic and turn heat down to medium-low. Cook until onions are translucent and soft. Stir in flour and mix until well-combined and mixture starts to brown. Add milk, nutmeg, salt + pepper and bring to a boil while whisking occasionally to remove any clumps. Cook until the sauce thickens to your liking (~20 mins). If the sauce becomes too thick, add pasta water to thin. (Sauce will thicken as it cools). Cook pasta until al dente and remove from the water, setting aside (don’t discard pasta water). In the same boiling pasta water, blanche mustard greens for ~1 minute and remove. Put greens into ice bath to stop cooking process (or run them under cold water). Drain the greens to remove excess water. If necessary, reheat sauce. Then, off the heat, toss the pasta, ham and mustard greens together in the skillet with the sauce until well combined. Portion into bowls and top with freshly ground black pepper.